The auspicious attachment to the bat in China highlights how different two cultures can be. In the West, the bat has almost always had sinister overtones. In China, however, it was far different. There is an aura that has evolved around the Chinese Export Silver [Qing Dynasty Silver] repertoire that is riddled with folk tales that have, over the years, stuck and somehow have become fact. They are almost too many to mention, and to do so would make it seem as if I was trying to rewrite the history that surrounds an entire category of silver. But some tales do need either rewriting or at least re-adjusted and one such surrounds the purpose of a box that appears with reasonable regularity. The highly stylised peach and bat-form box in itself has very definite feminine connotations within the world of Chinese symbolism As a decorative motif, the bat is symbolic of blessings and its being combined with a peach is one of the most frequently used decorative compounds in Chinese art; as with all such compounds, it can have complex allegorical and auspicious meanings. The Chinese word for bat is fú [蝠]; the Chinese word for happiness is fú [福]. Although they have different characters in Chinese, they sound the same and as such are homonyms; they are also a rebus – a pictorial pun of two nouns, sounding alike yet able to convey different meanings. The bat and peach combined motif is almost always showing the bat with spread wings. In this manifestation, the bat is known as fu i [附翼] or ‘all-embracing wings’ and it became particularly favoured by the Qing Dynasty. The silver box [above left] is in the traditional form of the bat and peach combination. 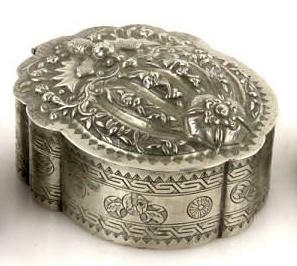 This particular box is by Wen Hua of Beijing; probably the most prolific “creator” of these boxes which may indicate they were particularly popular with ladies who frequented the Imperial court; a fashion accessory of the time, if you will. Occasionally the boxes appear internally fitted out with two or three sections; some even have a mirror fitted into the lid interior. This auspicious attachment to the bat in China highlights how different two cultures can be. In the West, the bat has almost always had sinister overtones. In China, however, it was far different. According to Fan Zhang, “this association of bats with auspiciousness is related to the poetic idea of the sudden arrival of good fortune – like a bat suddenly flying across your field of vision at dusk.” “It is something to look for and something to look forward to.” A bat’s habit of hanging upside down and ability to remain motionless also led to it becoming a symbol of longevity. In Chinese culture, bats are perceived as having an other-worldliness, but in a good way. 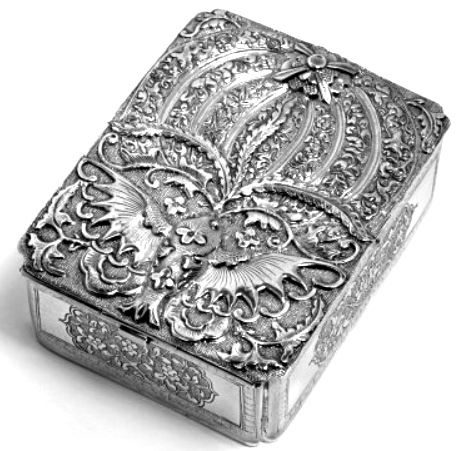 While Chinese silver objects, as with Chinese decorative objects of other media, are virtually always carriers of allegory, these boxes are somewhat in a league of their own; they could almost be regarded as a form of amulet, willing good wishes to the owner through allegorical meaning and symbolism. The peonies in the alternating middle frieze on the side of the box can almost mean longevity when taken in the context of the tree peony mudan [牡丹]. But the peony can also have the name fuguihua [富贵花], meaning “flower of wealth and honour”. The peony can also embody female beauty and lushness. The peach is one of the “three abundances”, sanduo [三多], the other two being the pomegranate and the citron. Singularly, the peach represents longevity. The combination motif of the bat with the peach is conveying the main message of fushou shuangquan [福寿双全]“may you possess blessings and longevity”, in itself interesting because in the world of Chinese phrasal etiquette, this would normally be reserved for a more elderly person, usually a relative, at the new year. 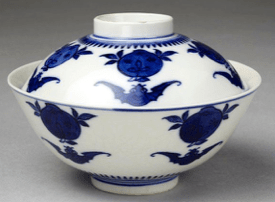 The peach and bat combination was also used in Chinese porcelain decoration, as can be seen in the lidded blue and white porcelain tea bowl [circa 1662-1772]. 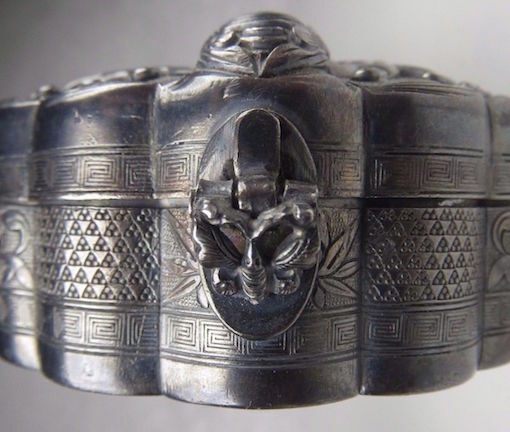 The misconception surrounding the meaning or use of these silver boxes appears to have evolved entirely in the West [most probably North America] and probably as late as the latter part of the 20th century. Firstly, these boxes have become invariably referred to as being ‘Qingming boxes’; Qingming Jie [清明节] occurs on the 15th day after the spring equinox and is also known as ‘Tomb Sweeping Day’ [扫坟节]. It is a day spent visiting and tidying ancestors’ graves and involves various ceremonial rituals, including the offering of foods and the burning of incense sticks shāoxiāng [烧香] . Lilies and chrysanthemums are traditionally laid upon graves, while some people also burn money zhǐqián [纸钱] as symbolic offerings to the deceased. Qīngtuán [青团] or sweet green sticky rice balls are traditionally offered and eaten as well as a peach blossom porridge, crispy cakes sāzi [撒子], ‘qingming snails’ and eggs. As with many things Chinese, it is further complicated by the day also being known as Tàqīng [踏青], meaning literally ‘spring outing’, when it is traditional to fly kites, often with coloured lanterns attached. Taqing celebrates the coming of spring and the superstition that has evolved that by letting the kite fly away will ward off disease and bring good luck. 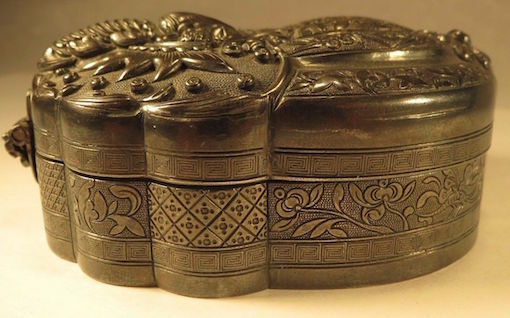 Some people have come to believe that the decoration of these silver boxes show a moth, not a bat; moths are believed to be the souls of deceased people who return during Qingming to visit their dearly departed. This is also a belief that has become confused over the years with the unique Huashu text or Book of Transformations that combines Taoist, Buddhist and Confucian alchemical and metaphysical thought, written in the 10th century Tang Dynasty. However, there is no evidence whatsoever that these boxes have any plausible connection with qingming ceremonial or tradition. Whatever legends have become attached to them are purely folk legend that has probably occurred due to a confusion over the bat and peach symbolism. The box, [left], also carries the mark of Wen Hua of Beijing; it is also decorated with a similar stylised bat and peach combination motif [below]. 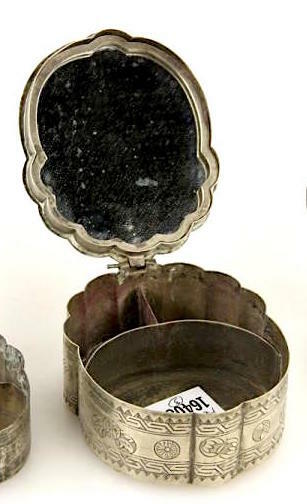 This particular box has been fitted with a mirror in the interior of the lid and the main box is sectioned into three compartments. This most probably indicates it was intended as some sort of cosmetic box. City, immediately east of Tiananmen Square. It is known that members of the Imperial court, including princes, literati and nobles patronised the few retail and artisanal establishments there as well as the several hotels, such as Hôtel des Wagons Lits. 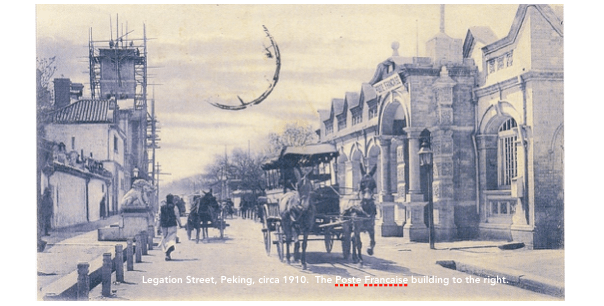 Towards the latter part of the Qing Dynasty, the Peking to Mukden Railway was established next to the Legation Quarter. The 1860 Convention of Peking obliged the Chinese to assist the British to acquire suitable permanent premises in Peking for a diplomatic mission. The newly appointed British Minister, Frederick Bruce, negotiated the lease of a 5-acre compound housing the palace of the Duke of Liang. 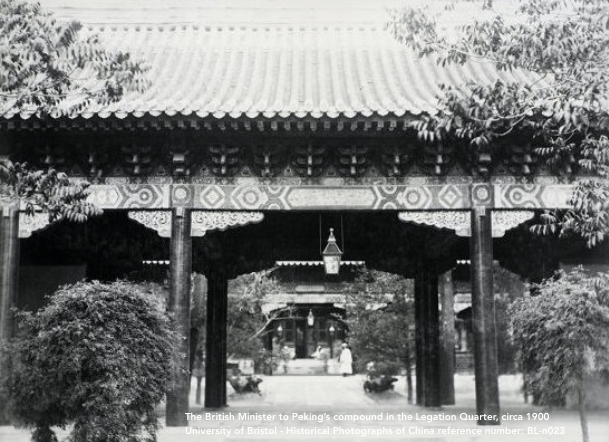 The palace itself, Liangongfu, which became the minister’s residence, was north from the gateway: a traditional Chinese building with a series of courts divided by handsome timber open pavilion structures roofed with green glazed tiles. It was all on one single floor, and was reconfigured as far as was practicable for its use as a diplomatic entertaining role by enclosing some open pavilions and connecting them with corridors in order to form a large single dwelling around a central courtyard. The interiors of the state apartment were handsome with the ceilings highly decorated ‘with gold dragons within circles on a blue ground, which again are in the centre of small squares of green, separated by intersecting bars in relief of green and gold’. While silver is probably the medium of choice for Chinese bat and peach-form boxes, it is by far not the exclusive material of choice. 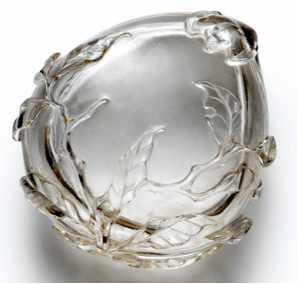 Perhaps the most extraordinary in so many ways appeared three years ago at auction in Hong Kong; a hand-carved rock crystal box from the Qing Dynasty Qianlong period [1735-1796]. Neither is the rebus combination confined to taking the physical stylised form; The box [below] is part of a collection held at the Isabella Stewart Gardner Museum in Boston, USA; a highly eclectic collection of art and artefacts from the travels of Isabella Stewart Gardner who amassed the collection of master and decorative arts over 3 decades at the end of the 19th century. Fenway Court, purpose built by Mrs Stewart Gardner to house the collection, is where the collection sits today. While simply rectangular in form, this highly decorated box was made by the Tientsin [Tianjin] silversmith, Qing Yun in the mid-19th century. 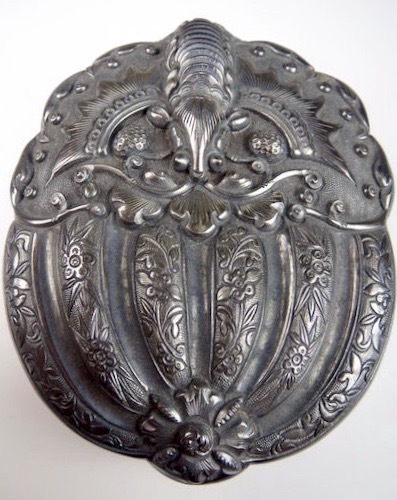 It is reasonable to assume this was a bespoke creation and while it, as with the more usual stylised form such boxes tended to take, it presents as a virtual hand grenade of allegorical meaning. 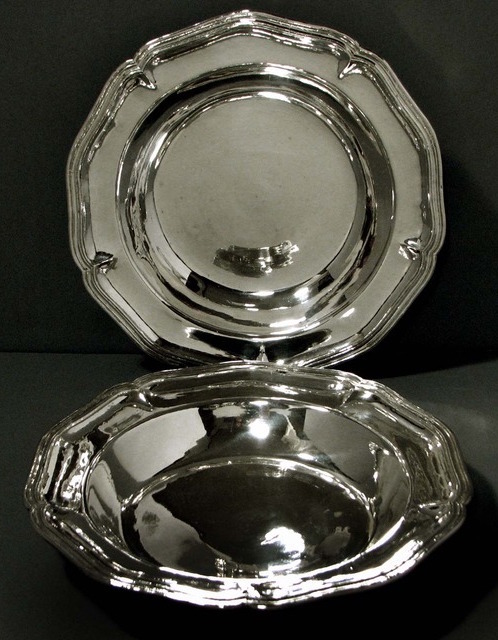 It is also plain to see that this silversmith has clearly taken great delight in lavishing many hours of work to create this tiny masterpiece. 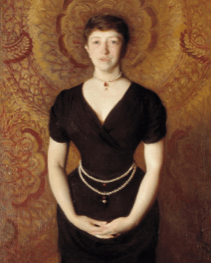 Isabella Stewart Gardner’s then newly acquired box was taken back to Boston in the United States where she lived. As such, it was a reluctant export, so to speak, but the vast majority of its “cousins” were undoubtedly made for or bought by Chinese individuals living in China. Again, perhaps, giving weight to the now more accurate perception that while some of the silver created in China during the Qing Dynasty was indisputably made specifically for the export This auspicious attachment to the bat in China highlights how different two cultures can be. In the West, the bat has almost always had sinister overtones. In China, however, it was far different; the vast majority of it was not.